With schools across the country deploying mobile computers at an accelerated pace this question is becoming more and more common. Spectrum Industries has long been considered the gold-standard and leading innovator in mobile laptop cart design and manufacturing. We have worked with educational organizations publications to define the criteria to consider when selecting a laptop storage cart. Below we will touch on the key components and features you should carefully consider when selecting the cart for your institution. 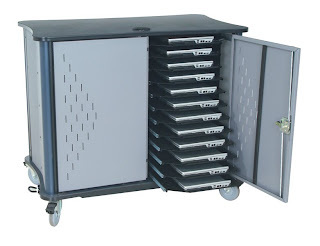 A laptop cart generally will hold between 12 and 32 fully-loaded laptops and at times a wireless access point, printer and auxiliary equipment. The value of these items can approach $50,000. With that kind of investment in technology security should be a primary focus when reviewing laptop storage carts. A high-quality, reliable locking mechanism should be a central feature included on all laptop storage carts. The ideal lock will secure the doors to both the top and bottom surfaces of the cart. A simple barrel lock or a single-position latch is not recommended as it provides limited protection. The appearance and operation of a lock can act as a very effective theft deterrent. Be certain there is solid construction of the cart and the manufacturer uses high-quality steel doors with protected and strong hinges. Carts should be highly maneuverable within and between classrooms. A selection of casters (wheels) to handle a variety of surfaces should be available and each cart should have a set of locking casters as a standard feature. Casters (wheels) should be durable, reliable and should roll easily when the cart is pushed. Ensure that the casters are rated to handle the weight of the cart and the laptops together. Easily accessible power for each laptop or power for small banks of laptops is preferred. This allows for quick removal and set-up for charging. For carts designed to hold a large quantity of laptops, a timer that switches between outlets will prevent excessive electrical loads or tripping of circuit breakers. A “retractable” power cord with a long enough cord to reach the nearest available outlet provides primary power to a cart in a quick and safe manner. The cart should provide students with safe and easy access to the laptops and power dongle. A pull-out tray for each laptop or for small banks of laptops is ideal. Additionally, locating each power outlet for the laptops on a side not accessible to students will help eliminate tampering and provides a reliable charging system. Just placing laptops and power cords on a shelf leads to unsightly and unsafe masses of cords. Cable management should include dedicated space for power, careful routing of cords, and using Velcro or cord clips, to prevent unnecessary movement. This takes more time initially but will make daily use of the laptops incredibly easy and maintenance free. Laptops become very hot during-use, after-use, and while charging. Vented side panels and doors will help avoid overheating. The venting pattern should utilize “chimney effect” heat dissipation patterns to promote the movement of heat through the unit and escaping near the top. Options should be available to store, secure, and power any dedicated printers, projectors, document cameras, wireless access points, instructional laptops, and other accessories required on each cart. 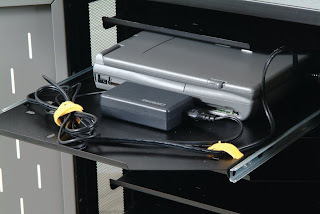 Laptop carts should open on two sides to allow easy access for equipment integration and troubleshooting. Clear instructions on how to properly organize wires, use power/timers, and attach options should also be available. Using quality materials in construction is vital to the long-term life of the cart. However materials are only part of the quality equation. 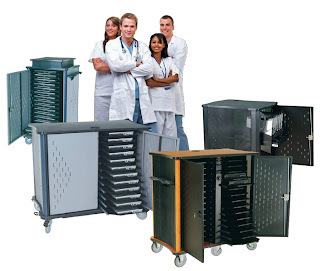 Each laptop cart is used in a variety of environments with many different individuals handling it on a daily basis. As such your cart manufacturer should have a stringent testing program should be in place. All carts should meet or ideally exceed ANSI/BIFMA testing standards. This will ensure they are constructed in a fashion that will ensure long-term reliability. Also, just as vendor viability is important in selecting a laptop manufacturer it is equally important in selection of a cart manufacturer. Look for a “partner” not just a supplier. A “partner” should work with each customer on selection of product and accessories, be there to answer questions, assist with changes, solve problems, and have a solid product warranty. While functionality is the primary focus on laptop storage products we cannot overlook the importance of the carts appearance. The color selection should work with the many rooms and environments the cart will be used in. Choosing a manufacturer that can provide laminates and paint colors from a number of suppliers may provide you the maximum in aesthetics. By carefully evaluating laptop storage carts based on the features listed above you will be certain that you are providing your institution the best possible cart for your application. At Spectrum Industries we are passionate about the markets we serve and the products we develop. To learn more about Spectrum Industries or the furnishings we manufacture please visit our website at http://www.spectrumfurniture.com or contact us at 1-800-235-1262. To help preserve the environment and provide a quick and convenience method of viewing our products we have added an interactive catalog to our website. Take a minute to review our products. We are confident that you will like what you find!